Take a seat at your new dressing table with one of our carefully crafted dressing table stools. Designed to match our furniture ranges! Take a seat with our great selection of dressing table stools, specially designed to go with our stunning collection of dressing tables. These stylish stools are ideal accessories in the bedroom, as extra seating in the living room, or even paired with one of our desks. They're made to tuck discretely under our dressing tables, saving floor space in your room. Constructed from high quality solid hardwood, they're made to match our furniture collections, and come in a range of finishes, including painted, nautral oak, mango, rustic oak and more. 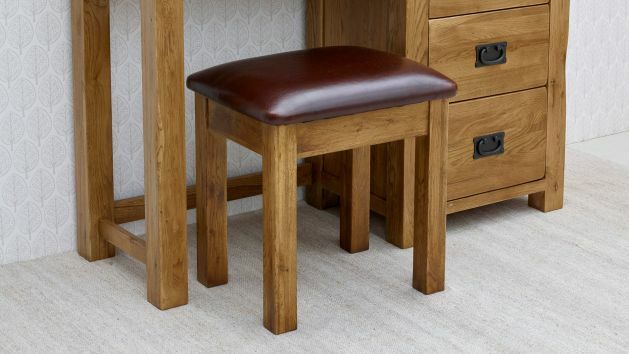 Several of our dressing table stools are upholstered with a stunning real leather padded seat too, for added comfort. Browse our range of dressing table stools below to find the perfect look to match your new bedroom furniture. Browse our selection of dressing table stools below and don't forget to explore our stunning dressing tables and dressing table mirrors as well!